Our tournament is organised and managed in conjunction with the Federation of International Touch, Touch NZ and the Touch Federation of Fiji. This is an incredible opportunity to get yourself on the radar of the sport’s governing bodies. Of course, we will send you away with glowing reference and invite you back next year should you wish to do it all again! The Fijian Touch Cup players are fast, fit and incredibly skilled. Although they play within the law they know the game and know how to stretch and manipulate the rules to work in their favour. These are no ordinary players, many of the Fijian players in particular are on a player development pathway that will see them perform on the international stage in the not too distant future. Refereeing at the Fijian Touch Cup will challenge you mentally and physically. Do you think you have the fitness to keep up with some of the Pacific’s fastest players? Can you maintain a level playing field within a fast paced game? Do you want to up your refereeing game in paradise? Like we said, many of the players who attend the Fijian Touch Cup are on player development pathways that will see them hit the international stage very, very soon. This makes the Fijian Touch Cup an exceptional opportunity for players but also an exceptional opportunity for referees and match officials too. Not only do you get the opportunity to up your game and challenge yourself but contribute to the development of players set to change the game big time. It will be your job to ensure that these players get the most out of their game so they can learn, grow and adapt to the challenges they will face on the international stage. 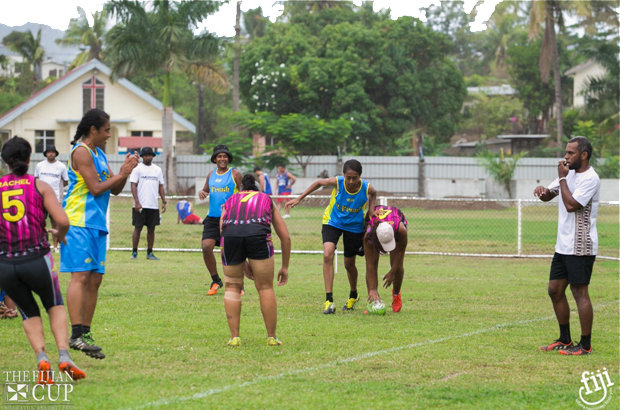 Touch rugby is no longer a simple training game for the age groups is a competitive sport in its own right and we need the best referees around to ensure that the Fijian Touch Cup remains the best touch rugby competition in the Pacific. You, as a referee, will play a key role in the success of the Fijian Touch Cup. This is a great reason why you should referee at the Fijian Touch Cup. In order to encourage referees to join us in sporting paradise we are helping to cover the package fees. Referee packages cost just $999 and include flights and accommodation. You too get a room at the Sheraton Fiji 5* resort and access to kayaking, snorkelling and stand up paddle boarding after the games have finished each day. Referees are a crucial part of our team and so of course you too will be invited to attend our epic end of festival party and prize giving ceremony. There are three great reasons why you should referee at the Fijian Touch Cup. To go right ahead and register your interest click here! The Fijian Cup is the most incredible Touch Rugby getaway in support of Touch FIJI, thanks to the support of FIT, Touch NZ, Fiji Airways and Tourism FIJI. Compete, relax and unwind at a tournament like no other! Fijian Cup is proudly brought to you by TourismHQ.